Home » Sponsored » Chakachaya ‘Here’ Ne Ecocash? Sponsored article. Please see our policy on sponsored stories. By now we are all aware of the messages from EcoCash about points balances especially after sending money through EcoCash. At first everyone was wondering what Chakachaya/Ziyawa KuEcoCash was all about. 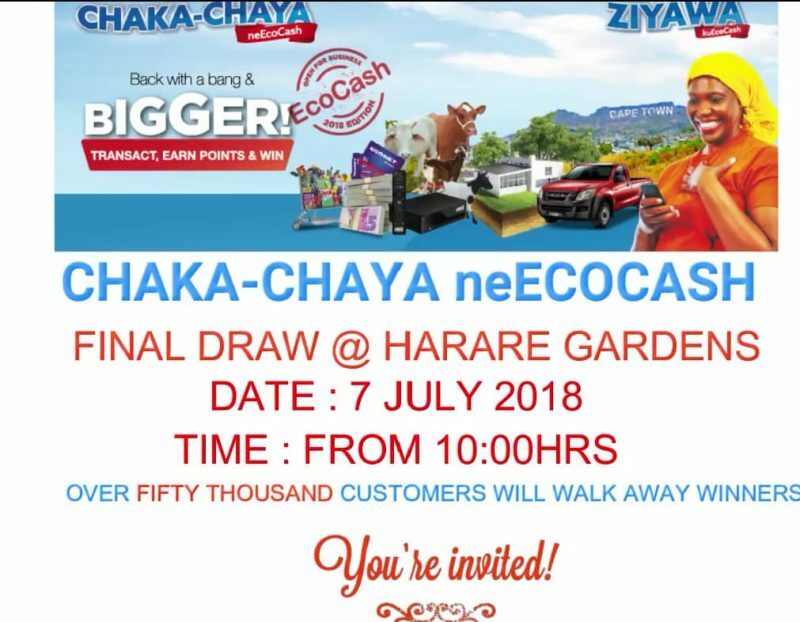 Now that most of us know that the messages that come after certain EcoCash transactions are detailing our points for the Chakachaya/Ziyawa kuEcoCash promotion, I’m sure now everyone wants to know Chakanyatsochaya here NeEcocash Chakachaya Here Ne Ecocash. These are some of the questions going through the minds of many people right now, Are we really going to win anything out of this promotion, what are the prices being won, who will win, what minimum points will make one eligible for the draw, how long till i get my price, what must i do now to increase my chances in brief Chakachaya Here Ne Ecocash? The Final Live Draw Is Happening Right Now! The 7th of July is the day all your questions on Chakachaya neEcoCash will be put to rest. Today, lots of prices will be won by people who transacted using EcoCash and have accumulated promotion points, some popular musicians will provide entertainment. and many people will walk away as winners. The event is taking place at the Harare Gardens and admission will is free. This will be the “moment of truth” day where you will know, Chakanyatsochaya Here Ne Ecocash!! Some have never won anything in their life even after entering every competition or promotion they come across. This makes them think why on earth would they brave the weather to go to Harare Gardens when they are almost certain hapana chavo.